Chomsky's theory of generative grammar and a human language faculty revolutionised and transformed the scholarship of linguistics and evolutionary psychology in the early 60s . Chomsky's observation that serves as the backbone of modern linguistics is, to put it very simply, that humans, unlike other animals, possess an “innate” ability to learn, understand and produce language. He called this mental ability a “language acquisition device” that gives human infants the ability to acquire language. He also asserted that there are some common grammatical rules that lay the structural basis of all languages. These set of grammatical rules are what he calls “universal grammar” . These views have swept over the fields of education, sociology, philosophy, literary criticism and logic. Not even students of computer science can graduate without encountering the works of Chomsky. He is among the eighth most quoted authors in the history of American academic journals. Dr Lila Gleitman, professor of psychology and linguistics, commented in 2001 that 'for the last 40 years', studying and researching in the field of linguistics and cognitive psychology had become 'a matter of agreeing or disagreeing with Chomsky – contributing to [his] program, or trying to contribute from a slightly different perspective'. Much of Chomsky's political writings demonstrate how public opinion is constructed in the context of free-market economy by the corporate media. And his works have influenced a diverse range of people: from literary critic Edward Said, to American rock band Pearl Jam, to the president of Venezuela, Hugo Chavez, to countless academics and researchers around the world. Born in 1928, Chomsky has been writing highly critical political analysis for more than seven decades. His first article published in the editorial of a school paper was a lament for the fall of Barcelona and the rise of fascism in 1939. And that was when he was about 11 years old. However, since the early 1960s, he has been a leading opponent of American aggression, war crimes and mass murder (as opposed to 'strategic missteps') in Vietnam, East Timor, Iraq, Palestine, Afghanistan, Central America and the escalation of wars under Obama administration and many other issues that it is simply inconvenient to name all of them here. He has been working exhaustively for world peace and its related issues for more than 50 years. Still, the incessant outpouring of his writings, and the frequent interviews prove that age has failed to make its mark upon his ever critical mind and has hardly succeeded in slowing him down. A crucial characteristic of Chomsky's radical position, as indicated by James Peck, is that his works do not fit into any critical school or intellectual tradition: for his anti-Leninist, anti-Bolshevik stance, even his linguistic theories were under total ban in the Soviet bloc while his relentless criticism of Western dominance around the world made him deeply unpopular in his own country. 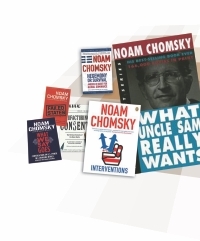 New York Time's statement that often appears on Chomsky's publisher's blurb is: “Judged in terms of the power, range, novelty, and influence of his thought, Noam Chomsky is arguably the most important intellectual alive today”. However, Chomsky always focuses on the next line that said: “Since that's the case, how can he write such terrible things about American foreign policy?” An often cited example of how hysterically he is abused by the conservatives and liberals is the talk show where William F Buckley, the host threatened to punch Chomsky in the face . There can hardly be any doubt that his works need to be represented outside the English speaking world so that intellectuals, activists and resistance movements around the world can benefit from the insight of one of the greatest minds of our time. His works have been translated into many languages including Bengali. However, anyone translating Chomsky's writings into Bengali is sure to appreciate the voluminous translations by A Al-Mamun who translated Chomsky's masterpiece, Manufacturing Consent: the Political Economy of the Mass Media into the Bengali. I believe it does not take long for anyone to understand how much scholarly work went into Mamun's translation of Manufacturing Consent, titled, Sommoti Utpadon . For one thing, the book is quite massive and required a lot of time to translate. For another, Mamun paid as much attention to retain the structural and rhetorical elements of the source text as was necessary to make a faithful rendering. However, people who have read the translation find that Mamun was too literal in a considerable proportion of the book, making the language unidiomatic and sometimes less readable. 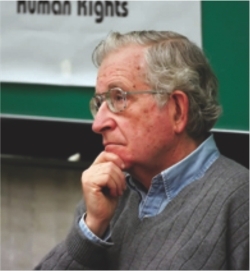 There are also the occasional appearances of translations of Chomsky's articles in the op-ed pages of mainstream Bangladeshi newspapers that have been playing a considerable, if not key role in introducing Chomsky's views to the masses.